Hi. My name is Zachary and my mom is Lori Anderson. Mommy bought me a camera and I've been taking all kinds of pictures of things and Mommy said I could show you some of them. OK, some of them are blurry, but she said that was ok. 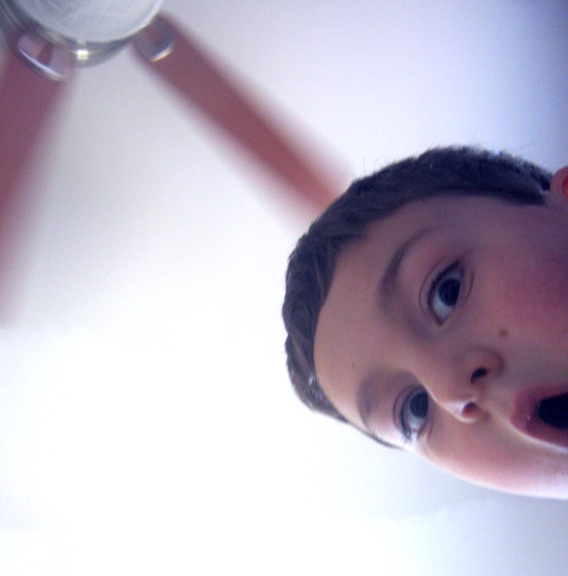 I like to take pictures of the ceiling fan spinning fast. It makes funny pictures. I also like to take pictures of me making silly faces. Mommy said I couldn't show you my REALLY funny faces because I was sticking my tongue out a lot but this one is still funny. And there's a fan in it, too. Ha ha, did I scare you? I scare Mommy when I sneak up on her and make this face! This is a picture of a shelf in our living room. 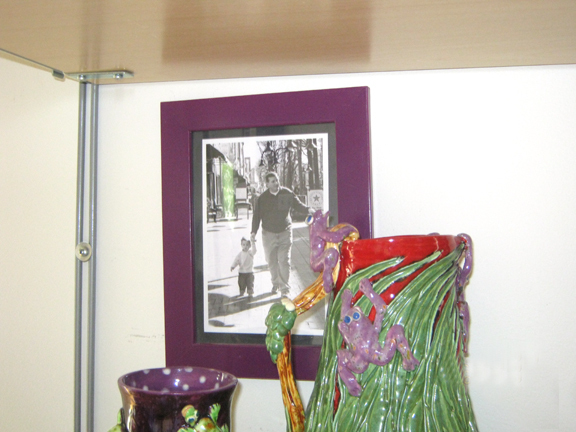 A friend of Mommy's made the frog vase. The picture is of me and Daddy when I was little. I want to show you where my Mommy works at her computer. It's very messy. She said it was ok to show you but she doesn't like her picture being taken. But I said, "Please" and she finally said, "OK". Mommy's office is pretty. 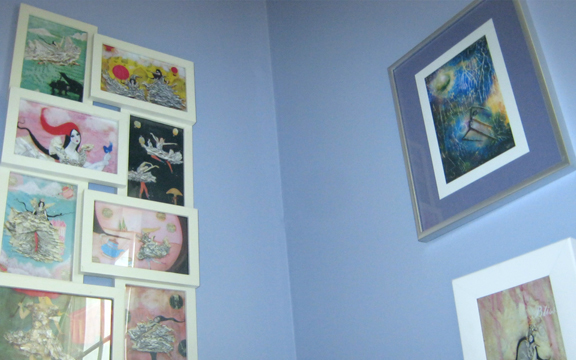 She has pretty pictures all over the place. I draw some for her, but some of her friends drew these. 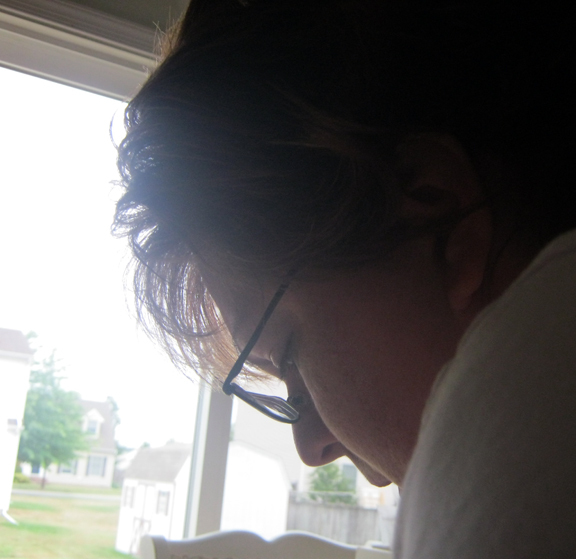 I took this picture of Mommy when she was beading. She thinks hard when she works. She teaches me about beading, too. I want to make glass beads when I'm old enough. OK, that's all the pictures I have to show you right now. I hope you liked my story and I hope Mommy lets me come back again. 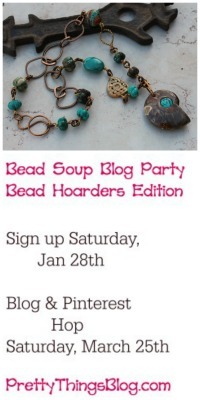 I *LOVE* that you blogged! I can't wait to show Grace and Ellie when they get home from school, because they're going to be so excited to see your photos and what you had to say. I've known for a long time that you are artistic, but I think these photos are proof that you have real talent. I'm looking forward to seeing more of your photos soon. Good job on the story and photos, Zachary! Can't wait for the next "guest blog." Thank you for sharing Zachary - I loved your photos. The one of your mom is wonderful and her beading shows her hard at work - you did a fantastic job. I really look forward to seeing the beads you create in the future. I hope you are able to return again too. This was a great post with great shots and a great story. I hope your guest blogger comes back in the future to share more of his art!!!! What a sweet post and such a handsome little boy. Well done Zachary! Welcome to blogging Zach! I am so glad you have joined us. You have a great eye with a camera. And I like your focus on the things that you know. Thank you for sharing that with us. 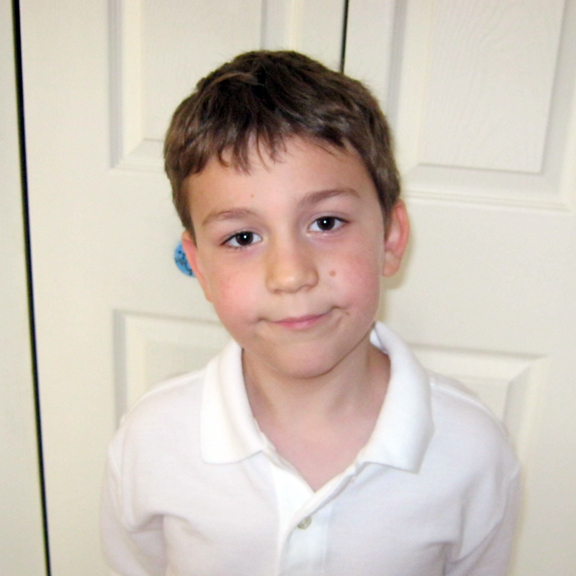 I have another blogger friend who has a son who does a blog post on his mom's site. Have your mom email me and I will send you the link if I haven't already. He is a wee bit older than you but I think you would like to see what he blogs about. I like your pictures, Zack! Great job, sir. I really enjoyed the self-portrait with fan. You are right, your mom's office is very pretty. Maybe your mom with left you make some polymer clay beads until you are able to handle a torch? Congrats on your first guest blog! I like your pictures Zachary, you did a great job. I would love to see more of your funny faces! What a great guest blogger! Zachary, I am so pleased to meet you! I love your photos and I hope you keep taking them. I especially hope that you will come back on Mummy's blog and show us more. Thank you very much for sharing a wee bit of your life with us. Great photos in this post ! 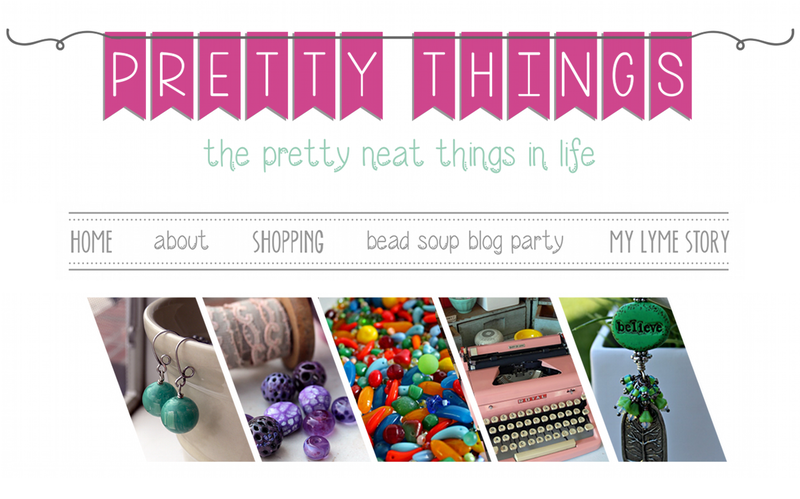 Is your header on the top of your blog new photo's too? I don't remember them. Then again I've been totally out of touch, so maybe I just dont' remember. Either way I think they are great, and I love the necklace in the center. What an adorable little photographer and blogger. You've taught him well! What a great post, congrats Zachary on a fantastic job. I hope you come back! Zach, you are a very talented young man. Your camera "eye" is very good, and you have a very pretty Mommy! Thank you for sharing your photos with us! And I like your silly faces! You did such a great job on this story. You have your mom's ability to take pictures and write! I would have never guessed that she had a messy studio, though! Thank-you for sharing your thoughts with us Zachary. You are a chip off the old block! Can't wait to see what is next! Hi Zack all the way from 74 degree weather Texas! Its so Nice to see you blog! That way Mom gets a rest. Ive heard how well you do at school..keep up the wonderful work! You made your Mom so proud. You took some great photos. Welcome to blogging, Zachary! 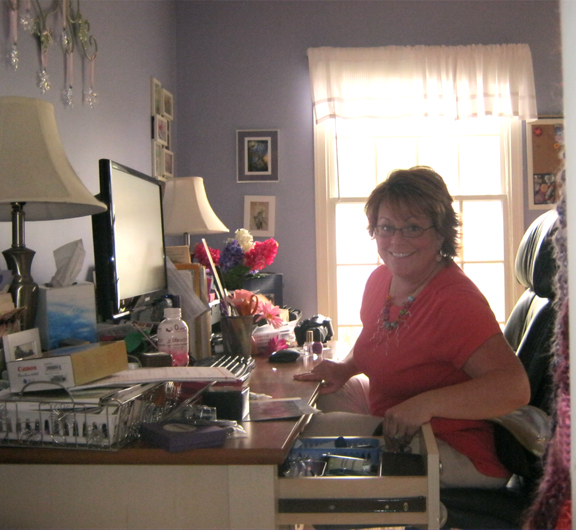 Thanks for sharing your photos - I loved the pic of your mommy at her desk. Thanks for "blogging" Zack! I really enjoyed seeing your pictures. Thanks for the peek at Mommy working. This is very special. Keep up the good work! Nice to meet you, Zachary! You have some serious talent going on. What a cool idea to photograph a spinning fan! 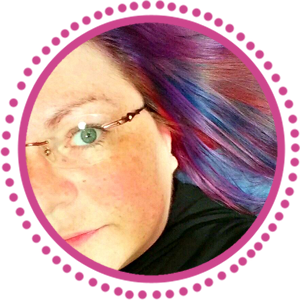 I hope to read another one of your guest posts soon, it's great getting to know you! Welcome Mr. Zachary! What nice photos (even the silly face with the fan)! I love the one of your mom--I'm so glad that she encourages your creativity! I'm sure that we all look forward to seeing you blog again! Great blog, guess it's genetic. Hi Zachary! You take really cool pictures, and I agree, your Mom's studio is really pretty! Great job! Great job Zachary! Keep taking those pictures and come back and share them with us again! I think it is very cool that you want to make glass beads when you're old enough. 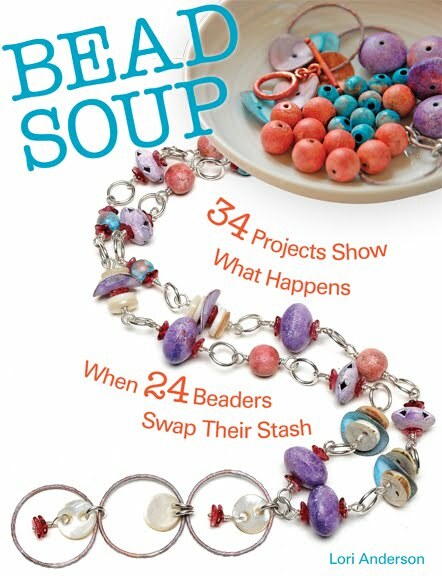 I know that you will have lots of fun, and I'm sure you'll make beautiful beads! Zack I hope you come back soon too! I am sure you made alot of other peoples day too! Your photos were great and I would love to see the art you create! Great job Zack! It really looks like you are enjoying your new camera and you are doing a most excellent job! I enjoyed reading what you wrote! Wonderful to see you, Zachary! That was a fun photo tour! Catching up on some posts in my reader and had to comment. Wonderful post. Loved learning more about you and see where your mom creates her beautiful jewelry. I look forward to another "guest post"
I love the photos Zach!! Your mom is one beautiful lady. And You both are awesome designers, and photographers.